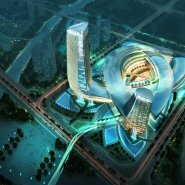 The new Yixing Dongju Far East Development will be a true “city above the water” and a landmark destination for the district. Designed to the highest sustainable standards, the large-scale mixed-use project is also closely integrated with the natural environment. Yixing Dongju Far East will be a modern, floating garden development. 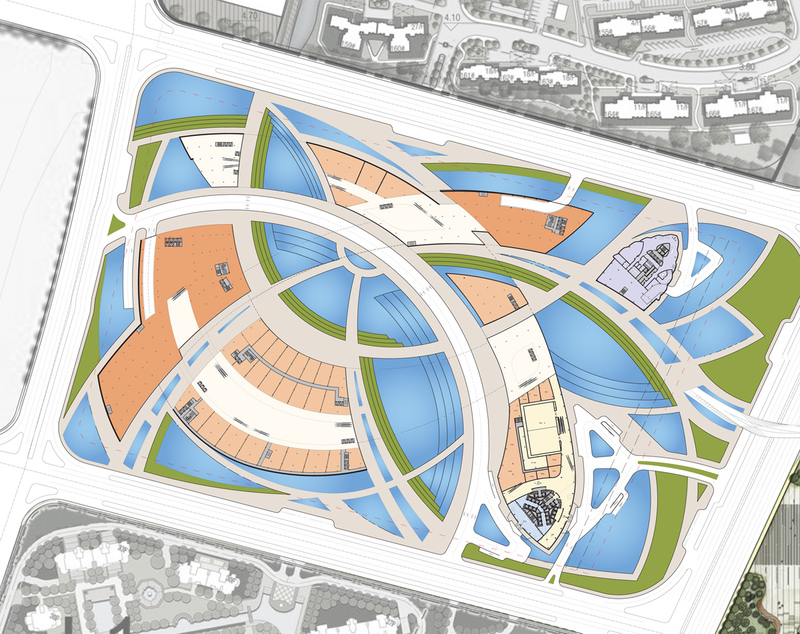 The two towers and retail podium are surrounded by a series of interconnected waterways that provide additional site access and a soft, flowing landscape, while referencing the canals that flow throughout the city, the arched shape of a bridge and the lake directly to the east. The development’s curving geometries extend both skyward and outward toward the city, recalling the organic form of a lily flower, whose petals rest on a larger body of water. 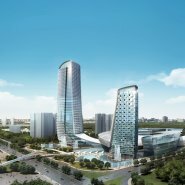 Anchoring the development are two towers, a mixed-use office and hotel tower and a neighboring residential tower. 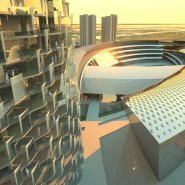 The towers connect to the podium roof which is covered in photovoltaic arrays, which create a compelling texture on the roof plane. Similarly, the exterior wall of the office tower features a series of shading devices made out state-of-the-art flexible fabric, which control natural light while recalling the shapes of lily petals. The tower also contains a conference center and meeting facilities, ballroom and a health center space. At the apex, an observation space and a club/restaurant offer stunning lake views. The adjacent residential tower features a series of alternating balconies, allowing for each unit to enjoy an outdoor space and balcony view and creating another richly textured exterior façade. The shape, arrangement and interplay of the balconies again evokes of the shape of lily petals, an influence that can be found throughout the development. The residential tower connects as well to the retail podium. The intersections of the three sections of retail podium allow for the creation of a central park space, which is active both at the ground plane and at each ascending floor. At night, the park can transform into an entertainment destination, making use of the levels of retail podium and further stepped ground planes at grade to create a dramatic theater space surrounding a myriad of performances in the garden. 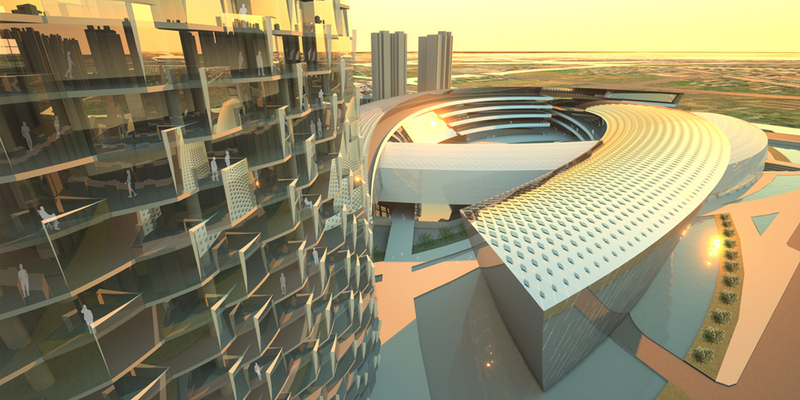 The materials used throughout the design have significant cultural and aesthetic meaning. Ceramic materials within the retail façade are reminiscent of the purple clay teapots that are manufactured in the region, while traditional materials like bamboo complement modern materials like an LED media wall. Sustainable technologies are integrated throughout the development and contribute strongly to the organic geometric aesthetic. A strong integration with the natural landscape is complemented by other passive technologies including natural daylight, shading, and ventilation. From an active technological standpoint, integrated photovoltaic arrays, solar hot water systems and high performance equipment and fixtures further contribute to the building’s overall sustainability. 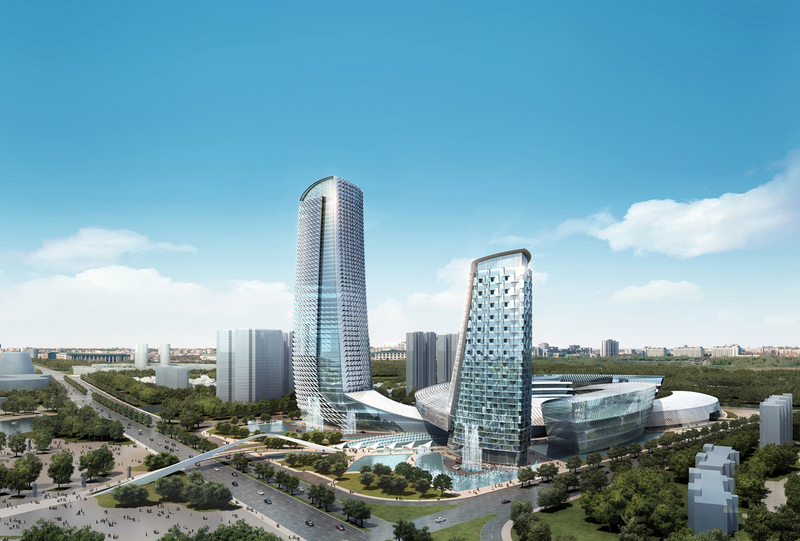 The new Yixing Dongju Development will make strong connections to the surrounding region through view corridors and forms and materials. At the same time, the development evokes a thoroughly modern aesthetic and incorporates modern technologies to improve overall development performance. 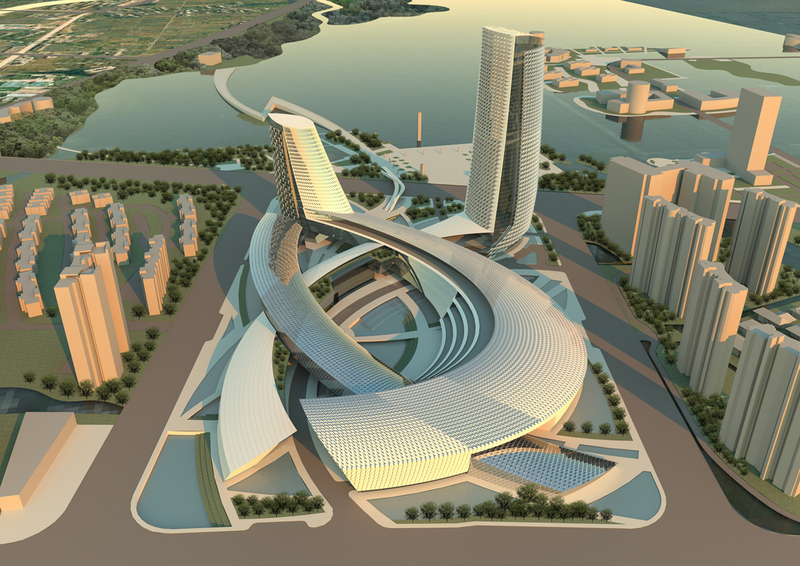 The result is a modern, connected “city on the water” that will become a new destination for the region and a model for 21st century development. 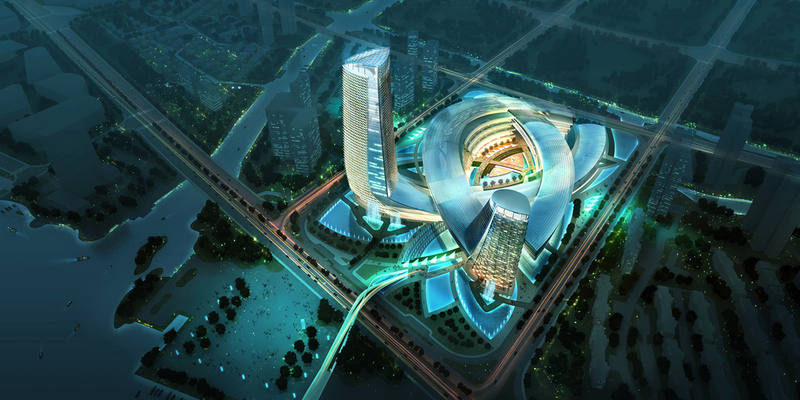 The new Yixing Dongjiu Development will make strong connections to the surrounding region through view corridors and forms and materials. At the same time, the development evokes a thoroughly modern aesthetic and incorporates modern technologies to improve overall development performance. 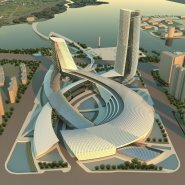 The result is a modern, connected “city on the water” that will become a new destination for the region and a model for 21st century development.